2. 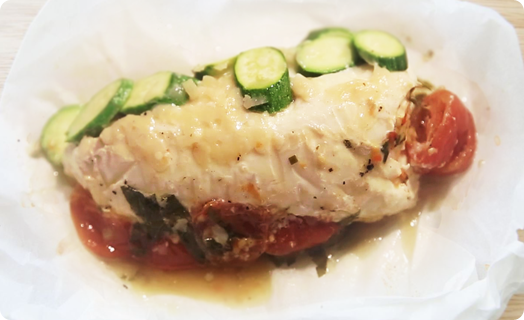 Place sliced zucchini in the center of the parchment paper. 3. Top with two tablespoons of Parmesan cheese. 4. Place the Halibut fillet on top. 6. Top with 1/2 cup of SMS Marinated Tomatoes. 7. Fold the parchment paper in half, roll, fold in the ends and roll in the excess paper. 8. Place on a baking dish and into the oven for 12 minutes. 9. Unfold the parchment paper (remember the contents will be HOT!). Enjoy!